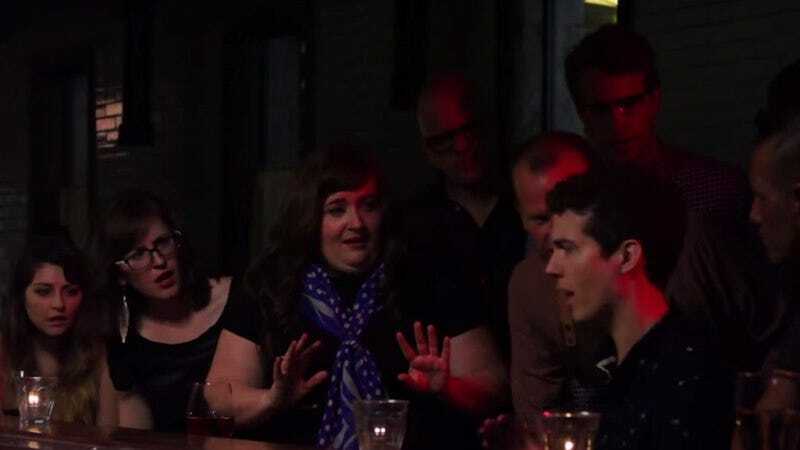 Aidy Bryant wants to teach you how to make friends ar a bar. The Saturday Night Live star pops up in “The Bar,” the latest episode of How To Make Friends As An Adult, a web-based sketch series from some people at Chicago’s The Second City. She’s joined in the clip by TJ Jagodowski, who some people might know as one of the guys from the “two guys in a car” Sonic commercials, as well as John Hartman, the star of the series. In the clip, below, Bryant is as weird and charming as ever, both chatting up and scaring the hell out of Hartman’s character as she houses a giant glass of red wine while making insane sexual accusations. Like so many sketches, the whole thing takes some weird turns before completion, but for anyone who’s ever wanted to watch Lil’ Baby Aidy talk about “licking it up and down,” it’s well worth a watch.